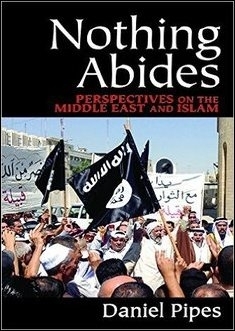 Nothing Abides: Perspectives on the Middle East and Islam, by Daniel Pipes. Transaction Publishers, 2015. Pipes is president of the Middle East Forum, and has taught at several universities as well as the US Naval War College. He is a public speaker of prodigious energy and singular courage in the face of Islamist intimidation. He has also made a major contribution to the debate over American foreign policy about how to put an end to the 68-year-old Arab war against Israel, which has forced its citizens to carry on their lives under a constant burden of peril such as no other nation has had to endure (unless we count the pre-Holocaust Jews of Eastern Europe as a nation without nationhood). Daniel Pipes has riveted his attention upon the threat that radical Islam poses to civilized life everywhere. Section 1, "The Arab-Israeli Conflict," is likely to be of most immediate interest to readers of The Algemeiner. One of its topics is the (interminable) "peace process," the peace processors and promoters, whose careers, in journalism and politics, demonstrate that in this realm nothing succeeds like failure, and (so Pipes argues) that "what is called the 'peace process' should actually be called the 'war process.'" In another essay, Pipes demolishes the Muslim claim to Jerusalem as entirely political rather than historical or religious. "Jerusalem appears in the Jewish Bible 669 times and Zion (which usually means Jerusalem) 154 times. In contrast, Jerusalem appears as frequently in the Koran as in the Hindu Bhagavad-Gita, the Taoist Tao-Te Ching, the Buddhist Dhamapada and the Zoroastrian Zend Avesta — which is to say, not once." Palestine Arabs were, of course, keenly aware of the ancient Jewish and Christian attachment to Jerusalem, to say nothing of the fact that Palestine's British colonial administrators and their children had for generations sung their aspiration to "build Jerusalem in England's green and pleasant land" (recently altered in certain parts of the United Kingdom to "build Ramallah in England's green and pleasant land"). Jerusalem did not become the focus of Arab political and religious activity until early in the twentieth century, in response to both the Zionist movement and Britain's assumption of the mandate for Palestine. This contrived embrace of their "holy city" is but one aspect of what Pipes calls, in another essay, "Mirror Image: How the PLO Mimics Zionism." Decades ago, Cynthia Ozick pointed to the way in which Palestinian Arabs have tried to hitch a ride on the mournful coattails of the whole Jewish experience of discrimination, oppression and murder. Pipes has brought this revolting story up to date, and in appalling detail. "To start with," he points out,"the very delineation of a territory called 'Palestine' in 1920 was a Zionist achievement; had Jews not pressed the British government to create such a unit, Arabic-speakers of the area would have continued to see themselves living in a Greater Syria or in an Arab or Muslim nation; there simply would have been no Arab feeling for Filastin...Palestinian nationalists have ...modeled their institutions, ideas, and practices on the Zionist movement." Featured dates in Palestinian calendars, for example, record actions and achievements not of their own but of the Jewish enemy. Nowhere is this carbon copying of the Jews in general more evident and outrageous than in what I called, in an essay of 1980, "Stealing the Holocaust." Lately this has incorporated the junk language of "inclusiveness," so dear to the hearts of progressives. Here is Sir Iqbal Sacranie, secretary general of the Muslim Council of Great Britain until 2006: "The message of the Holocaust was 'never again,' and for that message to have practical effect on the world community, it has to be inclusive. We can never have double standards in terms of human life. Muslims feel hurt and excluded that their lives are not equally valuable to these lives lost in the Holocaust time." How dare the Jews monopolize all that beautiful Holocaust suffering, in which we Palestinian Arabs would very much like, ex post facto, to be included; indeed, to claim for ourselves. Ruth Wisse has observed that "For some time now, and with ever greater forcefulness, Palestinian Arabs have been representing themselves as the real 'Jews,' systematically usurping all the symbols and terms of Jewish history and national consciousness...It may not be for us to question the Palestinian Arabs' claim that they are a distinct Arab people, but if they are a people, why do they represent themselves as Jews?" Those chapters of this lucidly written and very lively book most likely to appeal to all its readers are "Barack Obama's Muslim Childhood," "Lefty for Radical Islam: Dennis Kucinich," and "The Rushdie Rules Ascendant." The last returns to the subject of Pipes' prophetic book (The Rushdie Affair: The Novel, the Ayatollah, and the West (1990) in which he (virtually alone) tried to alert the Western world to the enormous political implications of a government (Iran's) picking a fight with a private individual, a mere novelist, in a foreign country (England), thereby calling into question the very notion of exile, and making a novel (The Satanic Verses) the occasion of a conflict between states. At this relatively early stage of what has become one of the most fully achieved careers of any Middle East expert, Pipes demonstrated how a quarrel over a book foretold the capitulation (starting in editorial boards and publishing houses, but culminating in the recent sham nuclear agreement) of America and the West to the technically competent religious fanatics of Persia. Edward Alexander's most recent book is Jews Against Themselves (Transaction, 2015). This article was first published in the Chicago Jewish Star.